Mitski Miyawaki responds to interview questions with the same thoughtful precision she brings to her songwriting. There is no flippancy in her answers, and they often approach familiar subject matter from surprising angles in a way that feels profound rather than willfully obtuse. One of the most striking qualities of Bury Me At Makeout Creek and Puberty 2, the albums that made Mitski one of the most celebrated musicians to emerge from the underground in recent years, was the calm composure she brings to emotional tumult. Even on her most frantic songs, the ones on which she seems to be splitting at the seams, the chaos feels controlled, as if she’s surveyed the situation and decided the only rational reaction is to wail at the top of her lungs. The unique mode of soul-bearing that makes for such fantastic music also yields fascinating conversation. I spoke to Mitski the day before her performance at Pitchfork Music Festival last weekend. Seated near the children’s play area in Union Park, we discussed the progress she’s made on the follow-up to Puberty 2, how she’s handling her newfound status as a role model and a celebrity of sorts, why she prefers listening to jazz and classical over the music of her peers, and much more. Read our Q&A below. STEREOGUM: After the last album and the response to it, you’re at a point where when you play at a festival like this you’re kind of like a celebrity within this world. Is that kind of a headfuck? STEREOGUM: I mean, wait until you get out there tomorrow. I feel like it will be that way. MITSKI: I think I feel the opposite. You feel like you’re a celebrity because you keep playing your own shows, and then you go to a festival and it’s very assembly line. It’s not about getting in the mood. It’s not about speaking to your audience. It’s just that everyone has been in the sun all day and they’re drunk. Then you just do what you can with what you got. Then once you finish it’s like, get off the stage, go, go, go. It’s just a very different environment. STEREOGUM: At your own shows and based on the interactions that I see online, you have a lot of people looking up to you and looking to you as a role model or hero or whatever. How do you adjust to that? MITSKI: The thing is, it’s not me. It’s my music or what [fans] think of me or what they project onto me. Thinking of it that way makes it so much easier for me because I am able to detach myself and perform. When they come to my [shows] they’re not seeing me. They’re hearing my music and watching, and I think that’s what I like about headlining my own show and performing at a venue and not a festival because you can create a space. You can create a moment in time, and you can control it to an extent. You can create a mood and fully kind of cater an experience with the audience. But going back to the whole role model, idealizing thing, when I go onstage and they’re cheering for me, they’re not cheering for me the person. They’re cheering for the parts of themselves that they like that they see in me. That’s what they’re cheering for. So they’re cheering for themselves. They’re cheering for an idea in themselves that they enjoy and relate to. But it’s not me. STEREOGUM: Have you had any downtime in the year since your last album came out? Or have you had time to chill and not perform music? MITSKI: Well, I don’t chill. The thing is, what I want to do is make music and make art. I think what’s hard for me is not that I don’t get downtime to chill, it’s that I don’t get time to make music. I think people don’t realize how little of being an artist is making art. 80 to 85% I’d say has nothing to do with music. I think what has been a struggle for me is that I keep having to do all the other stuff to promote my music, to travel and play shows, all the stuff that has nothing to do with art is the stuff that gets in the way of my art. STEREOGUM: Sorry to contribute to that! MITSKI: No, it’s OK! It’s fine. I don’t mean to patronize, but I like having real conversations like this. Any downtime I get I’m like, “Finally I can write something,” or, “Finally I can practice.” But I don’t get to do that much. STEREOGUM: Have you gotten to work on another album? MITSKI: Yeah, I have. But I can’t put it out for a long time because I still have a lot of touring to do. Putting out an album, I can’t just put it on Bandcamp anymore. I want to milk it. I want to make music videos. I want to actually promote it. I want to talk about it. So that takes time as well. Even if I had it — it’s not done yet, but even if it was, I couldn’t just put it out yet. STEREOGUM: Any vague, noncommittal things you can say about it? MITSKI: I think it’s different. That’s all I can say. I always have strong urges to sabotage myself. Whenever someone says they like something about my music, I tend to not want to do that anymore. It’s not even that I don’t like it anymore, it’s that I keep trying to find ways for people to dislike me. I think that’s kind of what it’s going to be about. STEREOGUM: I feel like this could go in a very dark direction and I could start probing about why you want people to dislike you, but I’m not sure if that’s a good idea or not. STEREOGUM: I imagine that you establish certain rhythms as a songwriter and as a musician in general, so how do you get into that uncomfortable zone? MITSKI: It’s hard to say because when I’m writing is when I feel right in the world. I think the discomfort comes more in the editing process than the writing process itself. I think with writing, for me, there’s still a lot of magic to it, a lot of mystery to it. I try to not to edit when I write. Then later on in the editing process I try to use techniques I haven’t used before or try to put phrases in song forms that feel a little wrong to me but I just keep it that way. I think the discomfort comes in the editing. STEREOGUM: Can you talk about the subjects that have been on your mind while you’ve been writing lately? MITSKI: I think a lot of bands and artists write albums thematically, but I don’t do that. I think when I put out an album is when I’ve collected enough songs to make up an album, and maybe any themes that come up are discovered after the fact. And right now I’m too close to it to really know what the album is about. I don’t set out to write something. I more just write and later on I discover what it’s about. So we’ll see what it’s about. I don’t know yet. STEREOGUM: What about other people’s music? What have you been listening to? MITSKI: I am currently leaving a bebop phase. STEREOGUM: Like how fast can we go and how much can we push the form? MITSKI: Right, right. And I like that era of bebop because I think it’s still trying to reach out to an audience, or it’s still trying to communicate something. I think it becomes a lot more openly masturbatory over the years after that. I’ve been listening to that and I’ve always been listening to a lot of classical. I shied away from classical classical for a long time and was only listening to contemporary classical, but I think I’m coming back to the romantics and the classical composers that everyone likes — the pop classical people. STEREOGUM: You’re a classical poptimist now. MITSKI: I think I shy away from listening to music that sounds like mine mostly because when, for example, I listen to indie rock now — I know that’s a really generic term — but when I listen to music with the same instrumentation as mine, all I can do is hear the production or see the trees and not the forest. I think in my downtime I try to listen to music that I can’t make, that way I can just listen to it. STEREOGUM: That’s cool. You mentioned that the album isn’t done and you can’t just rush it out onto Bandcamp or whatever. Do you have any sense of when it will be? MITSKI: It’s up to my label. 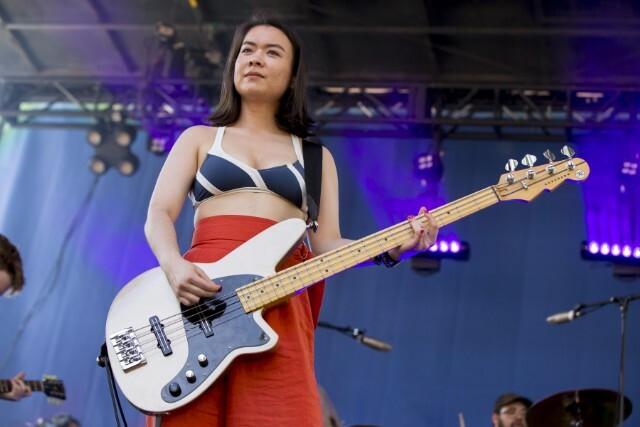 MITSKI: We’ll probably try to avoid the World Cup.